St Patrick's Bush is a hawthorn tree situated, about four kilometres south of Kilkenny, on the west side of the Kells Road (R697). It also marks the site of a church, graveyard and holy well. 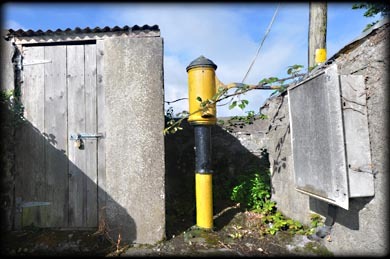 A water pump painted in Kilkenny's colours is all that remains of the holy well. To the south of the rag tree, almost hidden under the hedgerow, is a single bullaun stone. Inscribed on the northside of the stone is a simple out-lined latin cross. 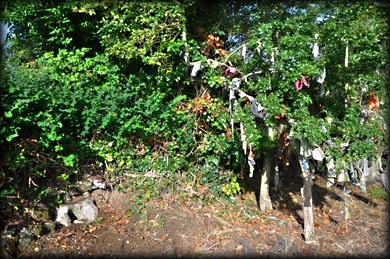 Locally known as the 'Raggedy Bush' the tree is associated with St Patrick and judging by the number of votive offerings the site still attracts a large number of visitors. This roadside location is quite dangerous, so please take care if visiting. Situated: From the Kilkenny ring road (N76) take the R697 south for about 3.5 kilometres, the site is on your right. I parked about 80 metres north of the rag tree. Please take care. Discovery Map 67: S 4974 5106. Last visit Aug 2017.